Like many manufacturers, SMOK has taken one of its popular mods and released a mini version. 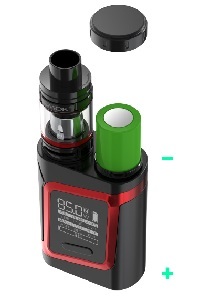 In this case the original is the Alien mod and the smaller version is the AL85. Smokstore sent an AL85 for a Seven Report review. 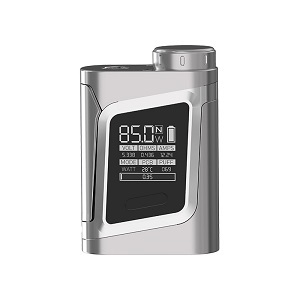 The SMOK AL85 borrows its display, menu system and basic shape from the larger, more powerful Alien. The biggest difference, besides the size, is the max power output. The AL85 has a wattage output of 1 – 85 watts. 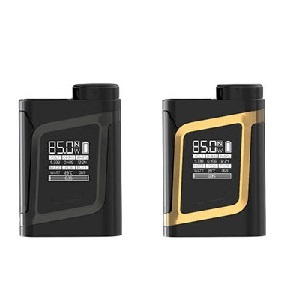 Powered by a single external (not included) 18650 battery, the AL85 will fire coils with a resistance range of 0.06 – 3.0 ohm in temperature control mode and 0.1 – 3.0 ohm in variable wattage mode. The battery loads from the top of the mod. You can charge the battery while it’s in the AL85 via the micro USB port at the top of the device with the included charging cable. The temperature range on the AL85 is 200° – 600° F and 100° – 315° C. Temperature adjustments are in 10° increments in Fahrenheit and 5° in Celsius. Adjustments in variable wattage mode are in 0.1 watt increments. To switch between temperature control and variable wattage mode you can enter the extensive menu system (which we cover in depth in the First Look piece) by clicking the fire button button five times. There’s also a shortcut for this function. Simply press the fire button and down button at the same time. SMOK has given the AL85 a very robust display, the same display as is on the Alien mod. It shows your selected wattage or temperature, the draw effect setting or type of coil, a “W” for watts or “C” of “F” for the temperature scale you’ve selected. There’s also a battery level indicator. Below that is voltage output, resistance of the attached coil, and amps. On the next row is the mode, PCB in wattage mode or watts in TC mode and a cumulative puff counter. Performance: For a mod of this size, with a max output of 85 watts, the SMOK AL85 is a solid performer. It fires when you press the fire button, or perhaps more accurately fire bar. The “Draw Effect” makes a noticeable difference in how hard or easy you need to draw. Features: SMOK has developed a very exhaustive menu system and has included it in a number of mods prior to the AL85. It’s so exhaustive that it’s pretty close to overkill. I’m more of a “set it and forget it” kind of vaper. Once I find a setting that works I tend to leave it. But if you enjoy tinkering with the settings, then the menu system on the AL85 should keep you happy for quite some time. Where the features on the SMOK AL85 are a little light is in the temperature control mode. The increments of change are in 10° increments in Fahrenheit and 5° in Celsius, instead of single degree increments. Quality: This is a solid, well made device. The display is big, bright and easy to read. If there’s one area where SMOK could have improved the quality of the AL85 it’s the venting. Some heat escapes from the battery cap on the top of the device, but there are no vent holes in the body of the mod. Looks: The AL85 borrows its basic looks from its big brother, the Alien. It’s a sleek, compact mod with big, bright display. This is a decent looking device bordering on cute thanks to its size. 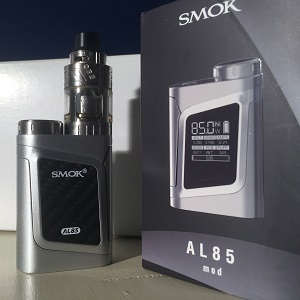 Price/Value: Smokstore, who supplied the SMOK AL85 for Seven Report to review, lists the AL85 for $33.90. That’s an excellent price for a mod with temperature control, variable wattage and such an exhaustive menu system. The AL85 is sophisticated enough to meet the needs of most vapers and would make a solid second device for even the most advanced vapers. I used the SMOK AL85 with the OBS Engine SUB tank for about a month and have been very pleased with it. Smokstore provided the AL85 for the purpose of this review. Order the SMOK AL85 from Smokstore.